SELF proclaimed rogue MP Jeremy Buckingham brought his Big L to Coffs Harbour on Monday. The Big L is to help voters find his group of independents on the large Upper House ballot paper. "Unfortunately, independents do not get a name above the line, so voters need to seek out the group they draw on the big ballot paper,” Mr Buckingham said. He is taking the Big L around the state. The Upper House is sometimes called the House of Review because of its role in scrutinising government legislation and holding the Government to account in a number of ways including the questioning of ministers at question time. Latest polling shows the NSW election on a knife-edge, and Mr Buckingham says votes from Coffs Harbour will be vital for deciding the result in the NSW Upper House. "The NSW election promises to be extremely close, meaning votes from communities like Coffs will be more important than ever. 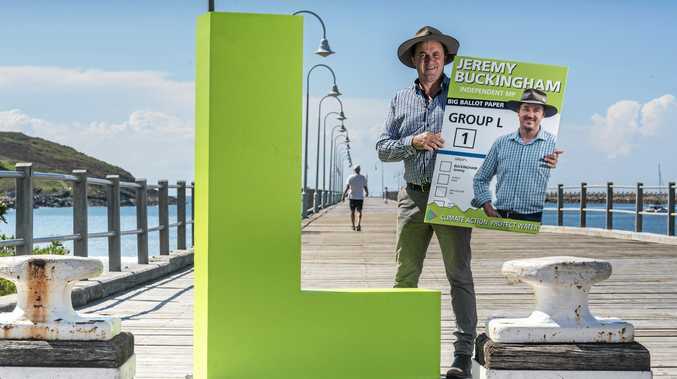 "As an independent I don't get a party name, so I've got my big L out in Coffs Harbour today to tell voters they need to look for Group L on the big ballot paper for the Upper House to vote for me," he said. He is joined on his ticket by a team of 15 community advocates, coal and coal seam gas activists and water campaigners that he's worked with over the years. He has identified a number of 'burning issues' for Coffs Harbour including getting the bypass built as soon as possible with tunnels and regulation of the blueberry industry. "It's a disgrace the bypass has taken this long. It needs to be built now with tunnels. He says the people of NSW need a climate warrior in parliament. "Our state is at a crossroads and the next State Government will be making critical decisions for our future. Whichever major party wins, I will hold them to account and push for saving the Darling River, climate action and renewable energy, stronger environmental protection and a fairer society. "I'm standing as an independent for the NSW Upper House and I need the vote and support of people in Coffs Harbour and surrounds. The people of NSW need someone in parliament who is a climate warrior, who will expose dishonest dealings and is not afraid of going a bit rogue to get the job done,” he said.